Session on Arab-U.S. Defense Cooperation with Mr. Jeffrey B. Kohler, Mr. Ronald L. Perrilloux, Jr., Mr. Christopher Blanchard, and Professor David Des Roches from the National Council on U.S.-Arab Relations’ 24th Annual Arab-US Policymakers’ Conference, “U.S.-Arab Relations at a Crossroads: What Paths Forward?,” on October 14, 2015, in Washington, DC. Dr. John Duke Anthony joined Inside Story on Al Jazeera English to discuss the U.S.-GCC Summit in Washington and Camp David, and U.S. pledges to defend its Gulf allies. 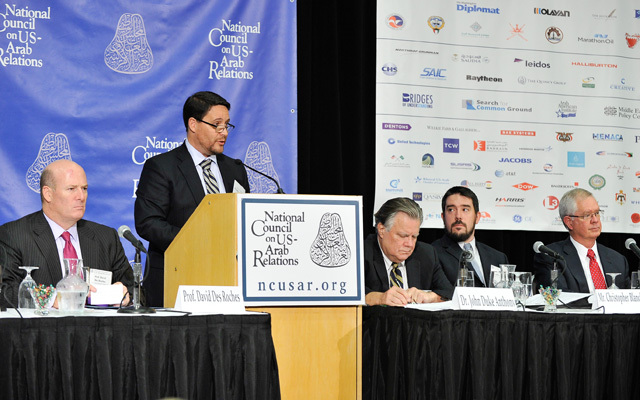 The National Council on U.S.-Arab Relations’ 23rd Annual Arab U.S.-Policymakers Conference included a session on “Arab-U.S. Defense Cooperation” that featured Mr. Christopher Blanchard, The Honorable Mark T. Kimmitt, Dr. John Duke Anthony, Professor David Des Roches, Dr. Kenneth Katzman, and Dr. Imad Harb. Mr. Christopher Blanchard – Specialist in Middle Eastern Affairs, Foreign Affairs, Defense, and Trade Division, Congressional Research Service, Library of Congress. Mr. David Des Roches – Associate Professor and Senior Military Fellow, Near East South Asia Center for Strategic Studies, National Defense University; National Council on U.S.-Arab Relations Malone Fellow in Arab and Islamic Studies. Mr. Robert Sharp – Assistant Professor, Near East South Asia Center for Strategic Studies, National Defense University. Dr. Janet Breslin-Smith – former Professor of National Security Strategy and Chair of the Department of National Security Strategy, National War College. General Lloyd Austin III – Commander, United States Central Command; former Vice Chief of Staff, United States Army; former Commander, U.S. Forces-Iraq (from September 2010 through completion of mission in December 2011); former Director, Joint Staff, Pentagon. Dr. Saad Alsubaie is a Distinguished International Security Studies Fellow at the National Council on U.S.-Arab Relations. The Honorable Molly Williamson – Distinguished Scholar-in-Residence, National Council on U.S.-Arab Relations; Adjunct Scholar, Middle East Institute; former Senior Foreign Policy Adviser to the Secretary of Energy (2005-2008); former Deputy Assistant Secretary of Commerce for the Middle East, South Asia, Oceania and Africa (1999-2004); former Deputy Assistant Secretary of Defense for the Middle East, Africa, and South Asia (1993-1995). VADM Robert Harward – Deputy Commander, U.S. Central Command; former Commander, Combined Joint Interagency Task Force 435 in Afghanistan; former Deputy Commander, U.S. Joint Forces Command; and former Chairman, Joint Chiefs of Staff representative to the National Counterterrorism Center. Dr. Anthony Cordesman – Arleigh A. Burke Chair in Strategy, Center for Strategic and International Studies; consultant to the U.S. State Department, Defense Department, and intelligence community; former Director of Intelligence Assessment, Office of the Secretary of Defense. Mr. David Des Roches – Professor, Near East South Asia Center for Strategic Studies, National Defense University; National Council on U.S.-Arab Relations Malone Fellow in Arab and Islamic Studies. A Window onto the Gulf Cooperation Council, Together With a View Regarding Its Involvement Of Late With Yemen – remarks by His Excellency Dr. Abdul Latif Bin Rashid Al Zayani, Secretary General of the Gulf Cooperation Council, to the Gulf Research Center’s Third Annual Gulf Research Meeting, University of Cambridge, Cambridge, United Kingdom. Introduction by Dr. John Duke Anthony, Founding President and CEO of the National Council on U.S.-Arab Relations. Ambassador James Larocco – Director, Near East South Asia Center for Strategic Studies, National Defense University; former U.S. Ambassador to the State of Kuwait. Dr. Joseph Moynihan – Chairman, Board of Directors, National Council on U.S.-Arab Relations; Vice President, Northrop Grumman Electronics Systems. General Joseph Hoar (USMC, Ret.) – Former Commander-in-Chief, U.S. Central Command with planning and operations responsibility for 27 countries in the Middle East, Central Asia, South Asia, and the Horn of Africa; Chairman, J.P. Hoar & Associates, a consulting firm engaged in business development in the Middle East and Africa. Col. David Des Roches (USA) – Professor, Near East South Asia Center for Strategic Studies, National Defense University; National Council on U.S.-Arab Relations Malone Fellow in Arab and Islamic Studies. Mr. Bob Sharp – Assistant Professor, Near East South Asia Center for Strategic Studies, National Defense University.